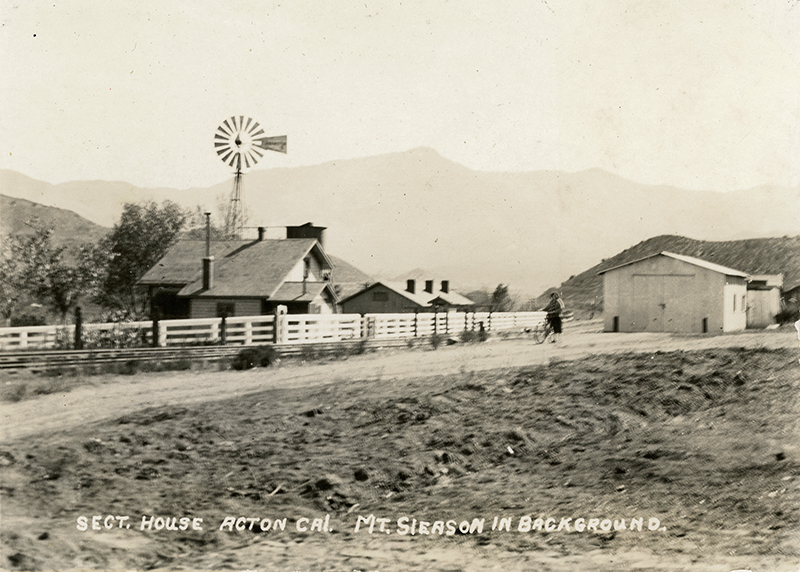 SCVHistory.com LW2943 | Acton | SPRR Section House; Mt. Gleason in Background. According to Acton historian Bob Buechner (pers. comm. 2017): "This is the home of an SPRR man named Joe Paradiso, a welder by trade who moved here from a Pullman car sitting in Ravenna. Tom Haile said he spent a lot of time here as a kid when his mom was at work. He still lives across the street from this location. After Joe retired from SPRR, he opened a Chevron station at Four Points junction on the way to Littlerock, and his daughter Mary and her husband opened a Chevron station next to Tip's on Sierra Highway." Don Milburn adds (pers. comm. 2017): "Bob Buechner is correct about the house. I spent countless hours there as a kid, playing with the Paradiso kids, John and Ron. It was right in front of Tom Haile's house." LW2943: 9600 dpi jpeg from original photograph purchased 2017 by Leon Worden.